First off I would like to wish all mothers a happy Mothers Day! My day started with brunch it was yummy. Then a visit from my daughter and her family. 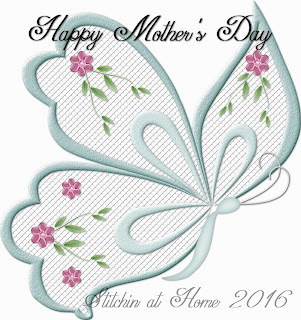 My youngest son is up in Northern Ontario working this weekend and called at lunch to wish me a Happy Mothers Day. My oldest son I will see later today. A finish is always a good thing, and when it's for a good cause it's even better. I used some novelty charm squares left from another project and put them to use in this quilt. I first blogged about it here. Hanging out in one of my shrubs. I quilted it all straight line quilting, which is something I don't usually do. It was hard getting some good photos today the sun just wouldn't come out and play nice. I put the squares up on the design wall with the solid blue and then sewed them in a nine patch configuration. A cool pattern quite by accident. The center I quilted in a square and the sides in triangles. My quilt holder upper was trying to keep it from blowing around in the wind. The center I quilted in the square and triangles on all four sides, it gives it a nice texture. I used Superior King Tut variegated blue thread for the main part and Essentials blue for the darker border straight line stitching. 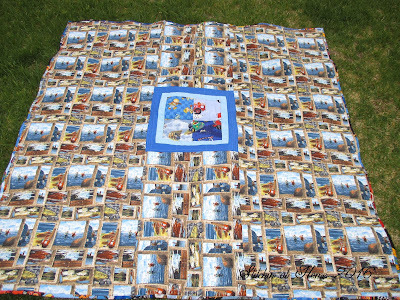 I am waiting to hear back to see if this quilt will be going to Ronald McDonald house if not then I will donate to Victoria Quilts for cancer. Both places are near and dear to my heart. One of our granddaughters had 4 surgeries in 6 years and my youngest son and his wife stayed at Ronald McDonald House in London. My granddaughter received a quilt when she was there last time, so I am hoping that this quilt goes there. Either way they require them to be washed first, as you can tell by the crinkly goodness I washed it already. The back piece has fish and fishing stuff in the print. The back depicts fishing stuff. And one last shot in my maple tree. This isn't the first quilt in the tree and I'm sure it won't be the last. 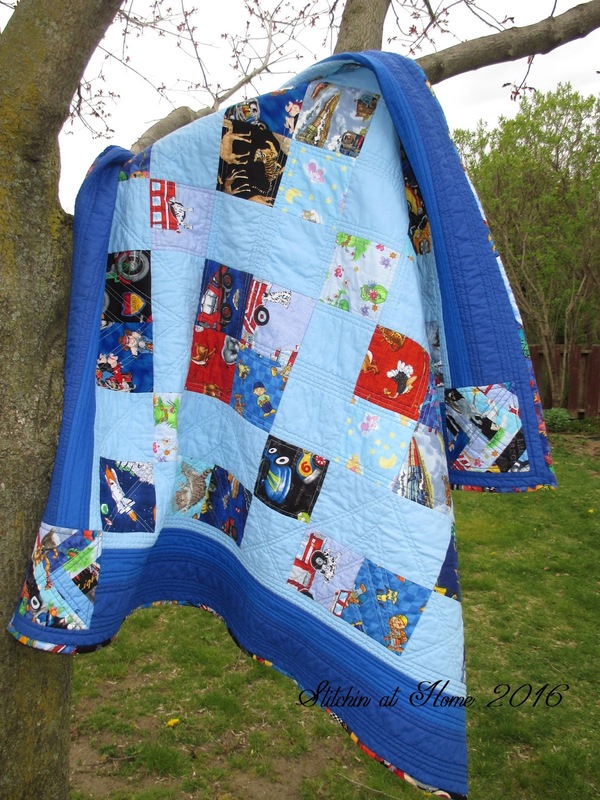 The quilt finishes up at 54'' x 54'' after washing a nice cuddly size for a little one. As you know I've become a bit of a quilts in trees girl myself, so I especially love that photo. Love that this is a boy quilt, love the backing; both mine are girl quilts, but I have two fabrics suitable for boys, which I will get to presently. I love how you quilted these, and funnily enough, I've been contemplating doing a quilt with straight line quilting myself, gulp! Ronald McDonald Houses are so important to so many families. I didn't know that about your granddaughter and how many surgeries she has gone through. I hope she is all okay now! Your quilt is a lot of fun with fabrics that will make people smile when they looks at them! It's sure to brighten someone's day Cindy! 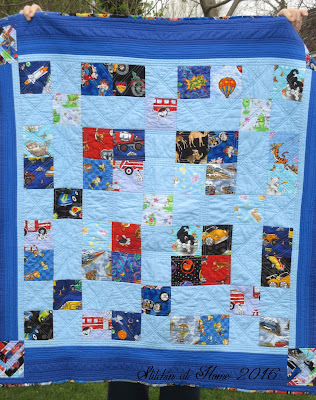 Cindy, what a great quilt for a great cause. I'm sure the little one that receives it will love it. This is wonderful I Spy quilt for a little one. Ronald McDonald House is an awesome place. I didn't know that quilts were given out at Ronald McDonald houses. That is awesome. They were a help to our family at one point some years back. I would like to make one for them. Yours is adorable! 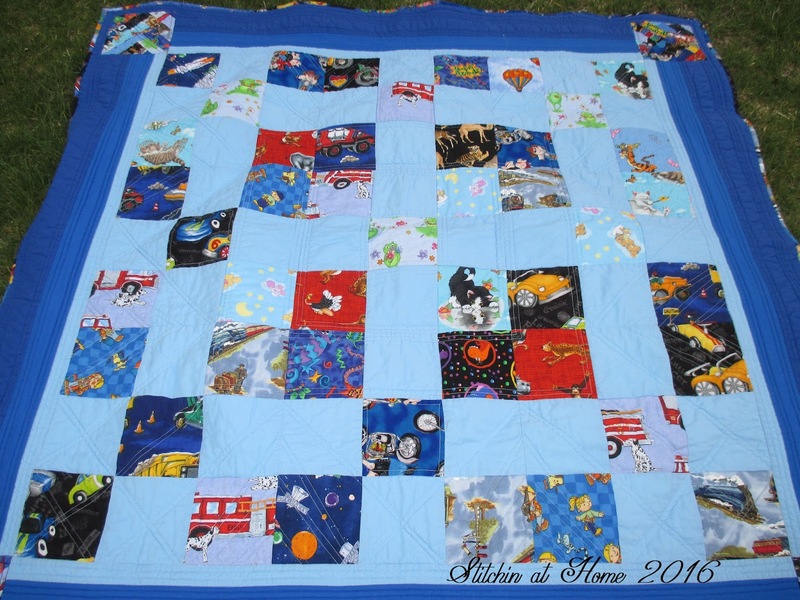 This would be a perfect quilt for Ronald McDonald House! It's just darling. But no matter where it ends up, I'm sure it will be well-loved by a child who needs it. 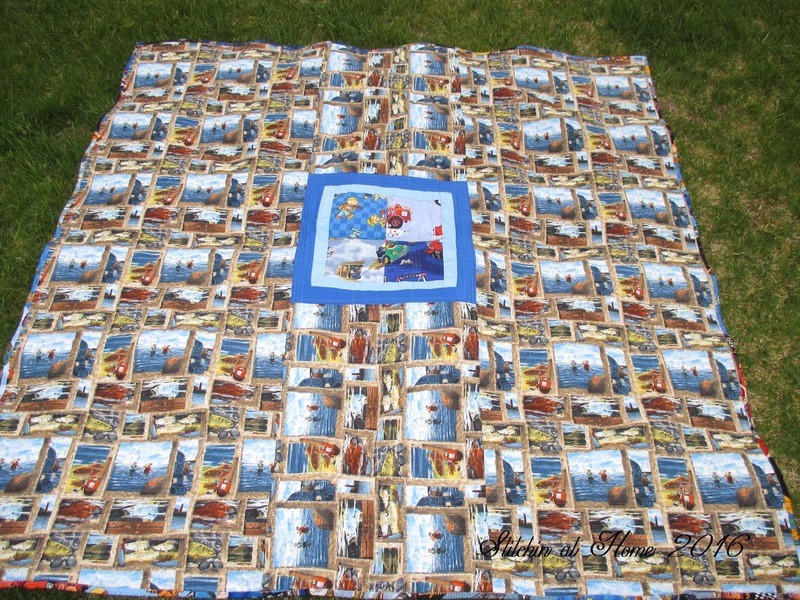 What a great fun I spy quilt, perfect for Ronald McDonald house. 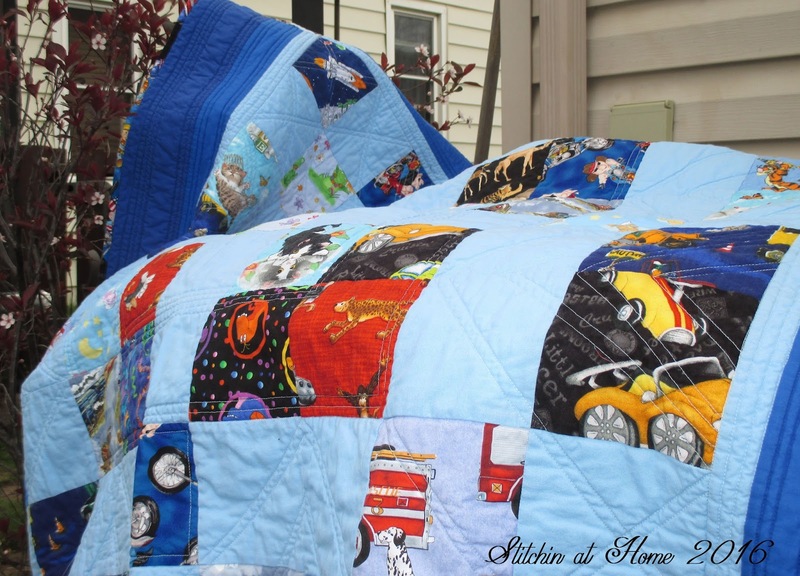 What a wonderful quilt, Cindy! Sure to make someone very happy while going through a difficult time. Thanks for participating H2H this year!